5/25 Cup of Coffee: Baseball was a brunch menu item on Thursday, with Pawtucket, Portland, and Salem all featured in 11:00 a.m. contests. The Sea Dogs took kindly to the early start, getting on base an outstanding 26 times. 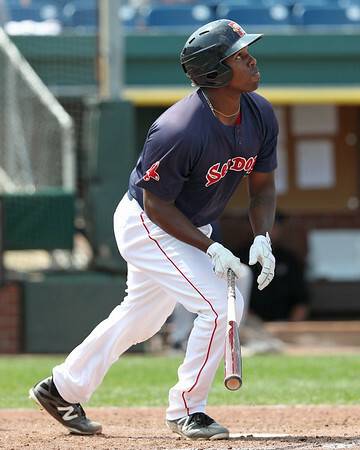 Josh Ockimey (pictured) provided the pop, leading the charge as one of four Portland players to reach base four times. Salem and Pawtucket were both more groggy, scoring one run apiece in losing efforts. The PawSox fell short in their attempt to complete the sweep at McCoy Stadium. Ivan DeJesus and Jordan Betts had two hits apiece, with Betts providing the lone Pawtucket RBI. Justin Haley allowed two runs on five hits in 4 2/3 innings, dropping to 1-6 on the season. The bullpen was again a strong suit for the PawSox. Kyle Martin struck out five without walking a batter over 2 1/3 innings, surrendering one run. Ty Buttrey pitched two scoreless, striking out a pair. Dustin Pedroia made his final rehab appearance, starting at second base and going 0 for 3. The veteran second baseman will be activated on Friday. A 15-hit attack backed Teddy Stankiewicz in Portland's sweep-avoiding blowout. Josh Ockimey led the way, blasting a three-run homer in the fifth inning and adding a double and a pair of walks. Jeremy Rivera was 3 for 5 with a double and a walk out of the leadoff spot, while both Isaias Lucena and Chad De La Guerra reached base four times apiece with two hits and two free passes. Jantzen Witte joined Ockimey in going deep, as his line improved to .422/.509/.733 in 12 games since joining Portland. The offensive outburst cleared the way for Stankiewicz, who allowed two runs on five hits in seven innings. He struck out seven without walking a batter, and needed only 87 pitches to complete the seven frames. The middle of the infield continues to be a highlight for Salem. Brett Netzer wasted little time extending his hitting streak to 12 games, as the second baseman ripped a double in the top of the first as part of a 2-for-4 day. CJ Chatham got the start at shortstop, going 1 for 4 with the lone Salem RBI. Chatham is now hitting .333/.373/.521 in 12 games since his promotion from Greenville. Jake Thompson had an uneven start, surrendering three runs in the third inning and two in the fifth, but also pitched into the seventh inning. He finished with five runs allowed on five hits in 6 1/3 frames. A strong start by Jhonathan Diaz was spoiled when he surrendered an ultimately decisive two-run homer in the sixth inning. Diaz had allowed just one run through five, as the Drive made a push to win their second straight. The left-hander finished with three runs allowed on five hits in 5 2/3. He struck out four, walked three, and induced 10 ground ball outs. At the plate, Charlie Maddon delivered his first home run of the season. Player of the Day: It was a slow start to the season for Josh Ockimey, who missed the first two weeks of the 2018 campaign, then carried a sub-.600 OPS into May. The ninth-ranked prospect in the system has been heating up with the weather, with a home run, double, and two walks Thursday giving him a .269/.414/.500 line for the month, including 20 walks and 10 extra-base hits in 23 games.